South Luangwa National Park is an un-fenced park in the landlocked country of Zambia. Its capital is Lusaka, one of the fastest developing cities in Africa. 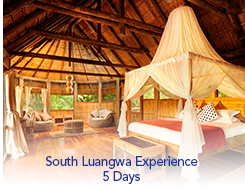 South Luangwa National Park's rich environment offers 60 mammal species and 400 species of birds.